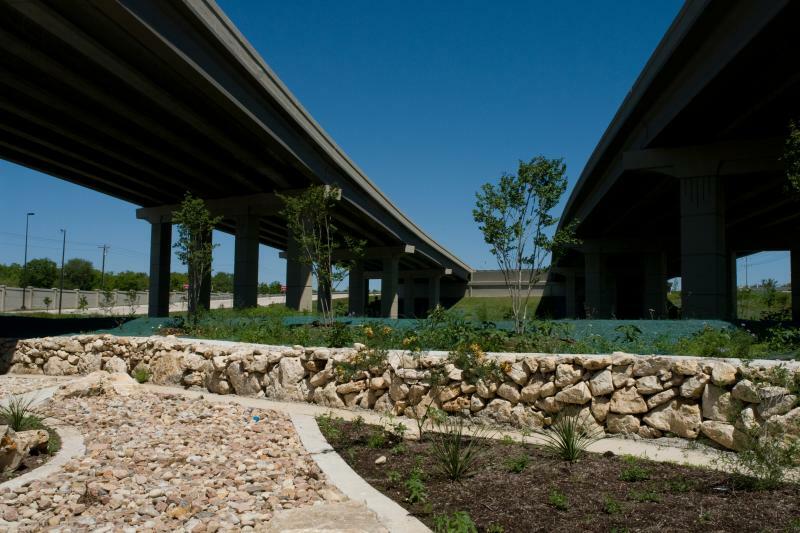 A new pedestrian path has opened along a stretch of the 183A toll road, connecting Leander and Cedar Park. The five-mile, ten-foot-wide path cost $3.1 million dollars and opens in conjunction with the second phase of 183A construction. The Central Texas Regional Mobility Authority is in charge of the project, and spokesman Steve Pustelnyk says the CTRMA hopes people will use the path for recreation and commuting to work. Sections of I-35 and MoPac are singled out in a new report as being among the 100 top traffic challenges in the Texas. The report (PDF) by TRIP, a national transportation research group, identifies four problem areas here in Austin. The worst and the toughest to fix, they say, is a stretch of U.S. 290 from MoPac to Farm Road 1826. The road offers no access for emergency vehicles during rush hours. Update 5:15pm: I-35 northbound is now open, though one lane may be closed through the night. 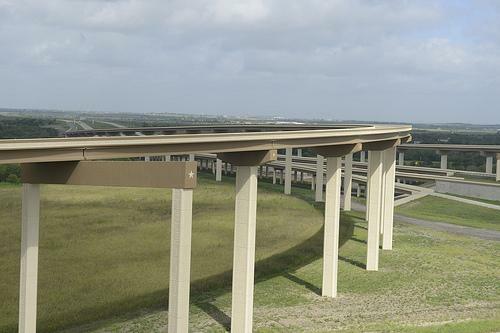 The Slaughter Creek overpass will be closed through tomorrow. Update: APD says I-35 northbound around the Slaughter Creek overpass will likely stay shut down through much of the evening commute. The overpass itself, which was hit by a tractor trailer, will be closed to traffic going over the highway for a day or two. Original post (2:14 p.m.): An 18-wheeler accident in South Austin has left one person dead and will shut down northbound Interstate 35 for most of the day. 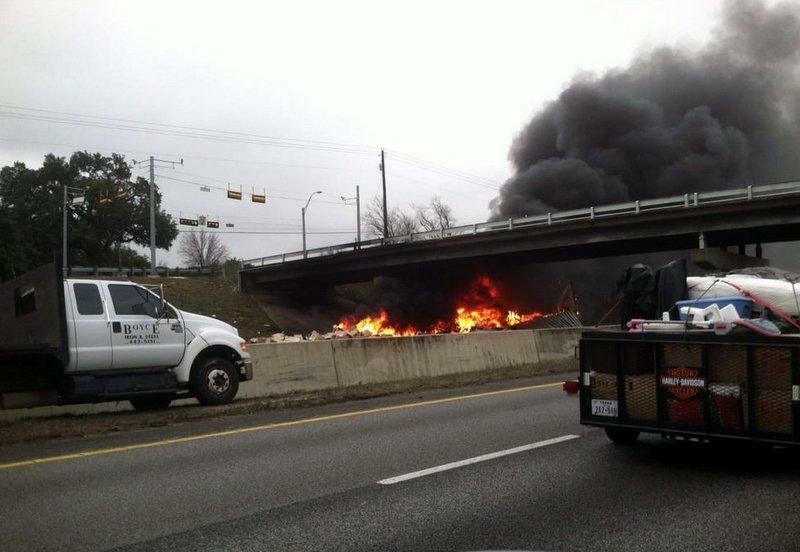 The crash and a fiery explosion occurred underneath the Slaughter Lane overpass. It’s the second day of the year and Austin already has two traffic fatalities. An Austin man and his 13 year-old son died in a motorcycle crash yesterday. Neither was wearing a helmet even though Texas law requires anyone under 21 to wear a helmet. People over 21 have to maintain a certain level of health insurance or they have to have taken a motorcycle safety course to ride without a helmet legally. Before 1997, all motorcycle riders had to wear helmets. 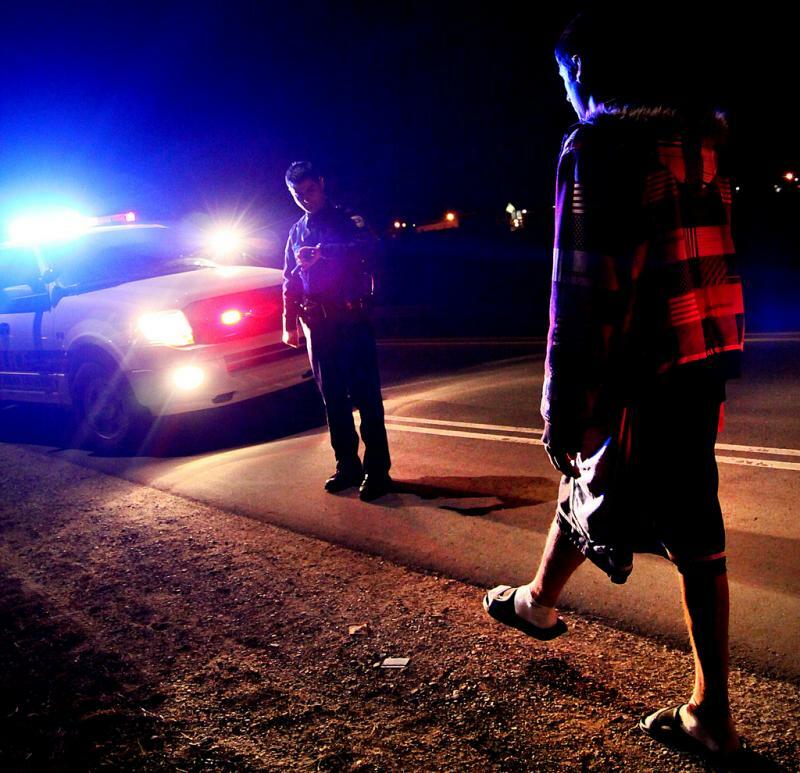 Update: Austin Police have scheduled another “No Refusal” enforcement this holiday weekend, where a judge is on call to approve warrants for suspected drunk drivers' blood. If you're headed on a flight out of Austin today, you may want to heed official advice and get there 90 minutes early. Or maybe even a little earlier than that. KUT's own Mose Buchele, a reporter for StateImpact Texas, sent us the photo above from the airport early this morning, well before the day's flight schedule had peaked. And it's only expected to get busier throughout the day. 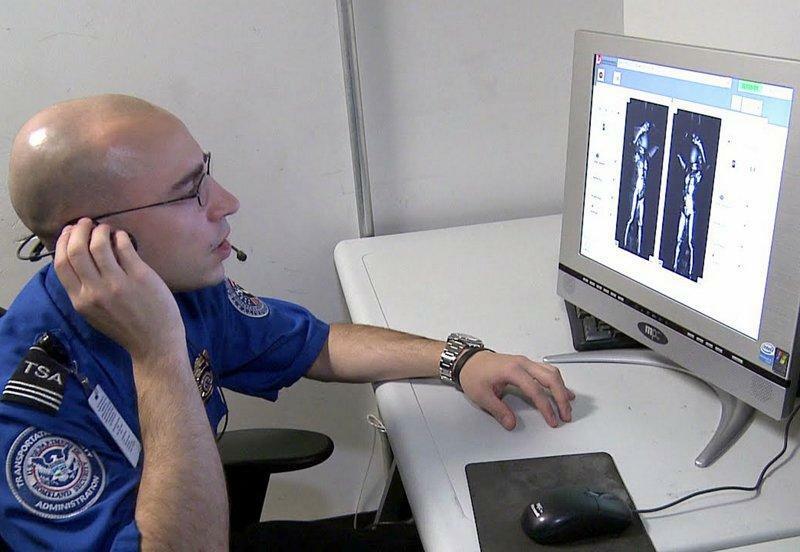 Following months of congressional pressure, the Transportation Security Administration has agreed to contract with the National Academy of Sciences to study the health effects of the agency's X-ray body scanners. But it is unclear if the academy will conduct its own tests of the scanners or merely review previous studies. 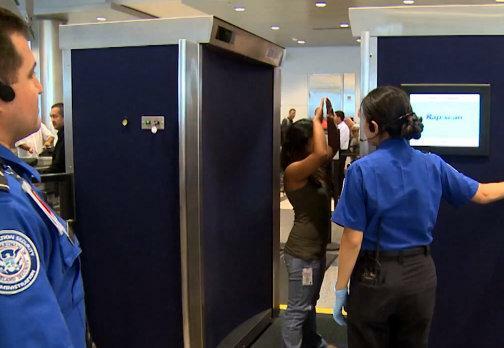 The machines, known as backscatters, were installed in airports nationwide after the failed underwear bombing on Christmas Day 2009 to screen passengers for explosives and other nonmetallic weapons. But they have been criticized by some prominent scientists because they expose the public to a small amount of ionizing radiation, a form of energy that can cause cancer. If you’re flying out of Austin for the holidays, be ready to arrive at the airport early and expect long lines. Austin-Bergstrom International Airport is advising travelers to arrive 90 minutes before their departure time from today through Dec. 21. Checkpoints open at 4 a.m. to give passengers on the earliest flights ample time to get check their bags and get through security. ABIA has also temporarily opened a fourth security checkpoint to handle the high volume of holiday travelers and reduce security wait times. 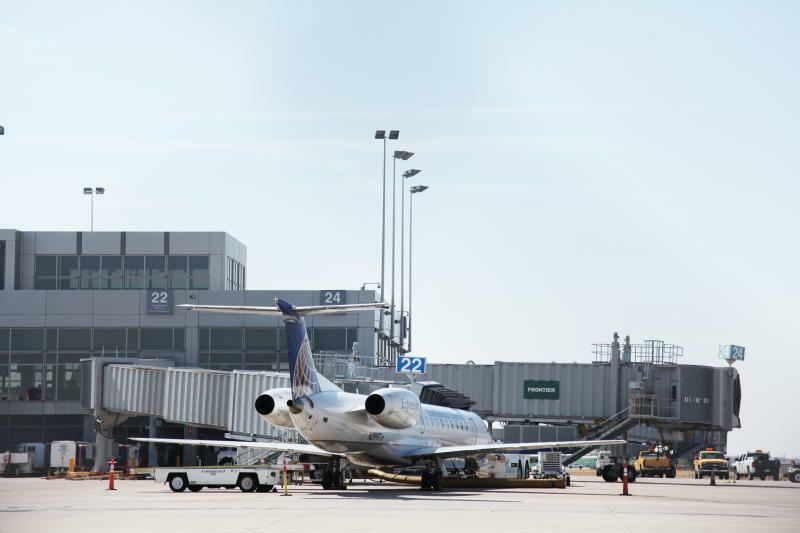 Austin-Bergstrom International Airport had a record August, according to data released by the City of Austin over the weekend. United Airlines and its regional carriers saw the most growth in August. They flew 47 percent more passengers than in August 2011. Some commuters may have had an easier commute this morning. The flyover connecting westbound 290 to southbound Mopac opened this morning, with workers uncovering signage and removing traffic barriers around 8 a.m.
At least two people are dead and dozens injured in a 100-vehicle pileup on Interstate 10 in southeast Texas that's being blamed on early morning fog on Thanksgiving Day. KFDM TV reports that the dead included a man and a woman in a Chevy Suburban that was crushed by a tractor trailer. State troopers told the TV station that between 80 and 120 people were hurt; they were taken to hospitals in Beaumont, Port Arthur and Winnie. The crash occurred southwest of Beaumont, 80 miles east of Houston. 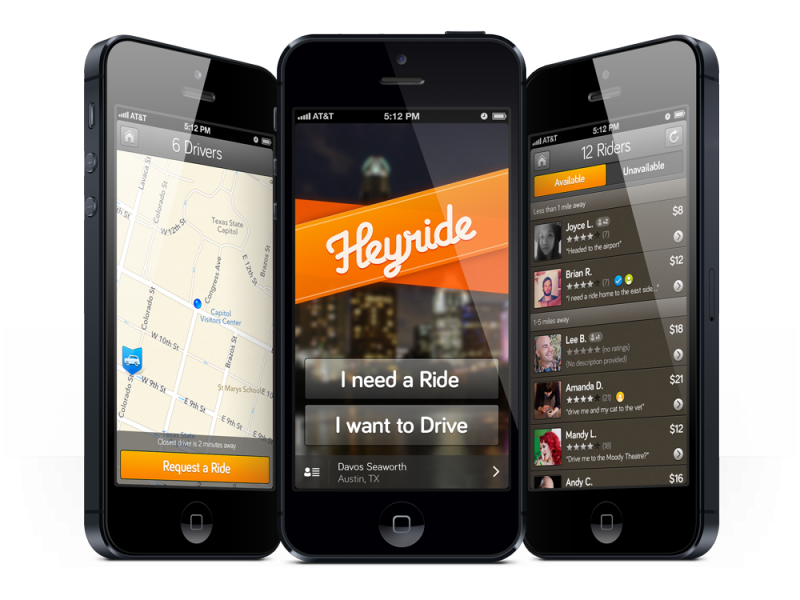 Heyride is a smartphone app that lets people find and offer rides to strangers for money. 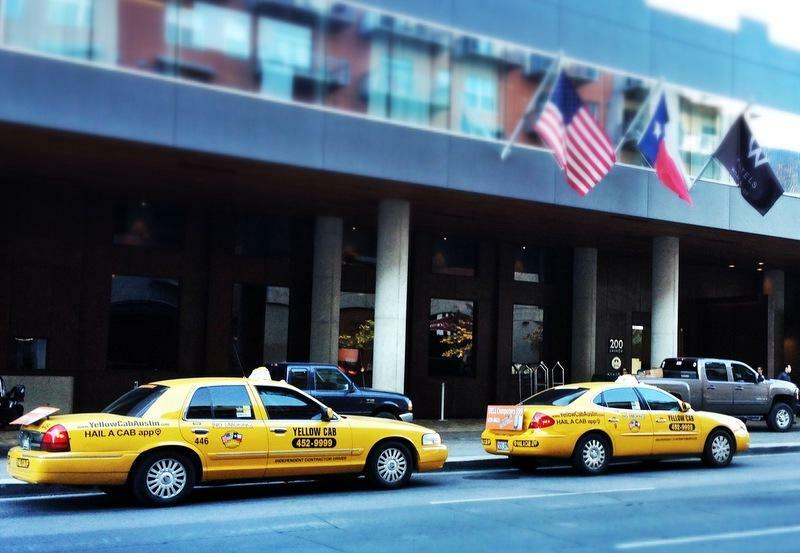 If that sounds kind of like a taxi service to you, the City of Austin agrees. Last month, the city sent a cease and desist order to the Austin-based startup. The city regulates for-hire transportation, doing criminal background checks on drivers and making sure vehicles are safe. But Heyride drivers aren’t going through that permitting and inspection process. Today is historically one of the busiest travel days of the year. KUT News has compiled a list of things you need to know before you hit the roads... or skies. AAA Texas estimates that about 3 million people in Texas will hit the road for Thanksgiving—that's up about 1.6 percent from last year. The good news for those travelers is that gas prices across the state continue to fall. The statewide average price for a gallon of unleaded is $3.16. Prices in Austin are slightly higher at $3.19. 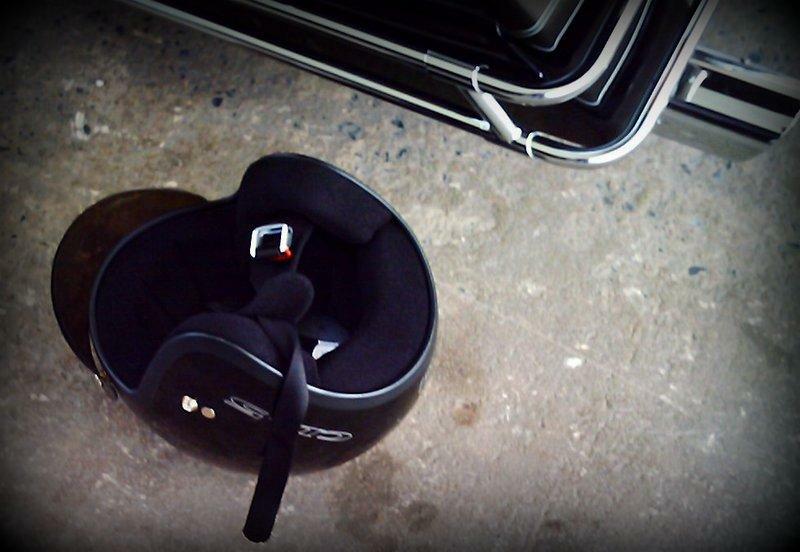 Click here to find gas prices near you. The Austin Police Department and the Department of Public Safety will have more officers on the roads over the next few days. They’ll be targeting speeders and drunk drivers. Austin-Bergstrom International Airport expects about 21,800 people will fly out today. That's far more than this year's Austin City Limits Festival exodus (some 18,000 people on Oct. 15). ABIA processed more than 9,000 passengers between 4 a.m. and 9 a.m. That’s about 3,700 more people than during that same period (actually 4 a.m. to 8 a.m.) last week. To help with increased demand, airlines added seven flights and sent bigger planes to Austin, adding a total of more than 2,500 seats. Chartered flights included 747 and 767 jets. The airport expects to stay busy all week as F1 fans continue to fly out and holiday travel begins. Last month, the Transportation Security Administration said it was moving nearly half its X-ray body scanners from some of the nation's biggest airports to smaller ones. But it turns out that more than 90 of the controversial machines will sit in a Texas warehouse indefinitely, agency officials said Thursday. The agency says it hopes to someday deploy the warehoused machines, but even that prospect was thrown into doubt by allegations that the manufacturer, Rapiscan Systems, may have falsified tests of its experimental privacy software designed to eliminate explicit images of passengers' bodies. Update at 9 a.m. ET, Nov. 14: "It's A Learning Lesson ... I'll Move Forward." 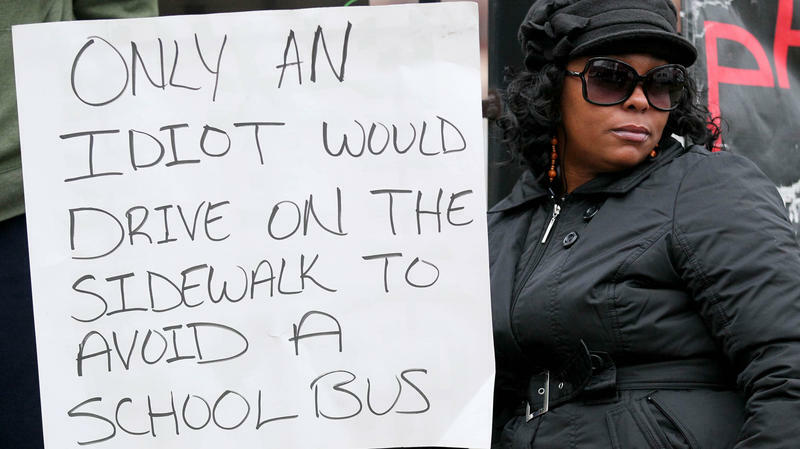 Shena Hardin, the Cleveland woman ordered to stand on a street corner with a sign saying she was in idiot for driving on a sidewalk to get past a stopped school bus, finished that two-day punishment this morning and issued a statement saying she's learned a lesson. 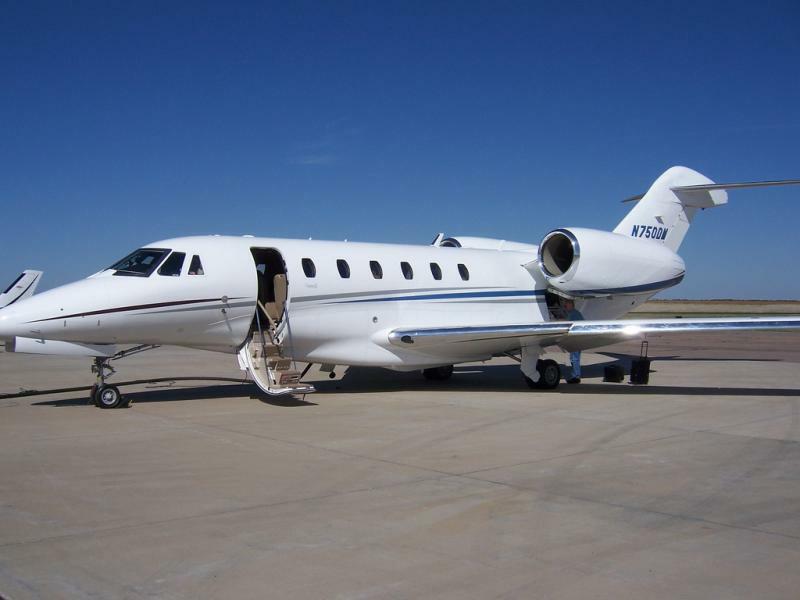 Private jet parking at Austin-Bergstrom International Airport is starting to fill up. Airport spokesman Jim Halbrook says more than 150 private planes, ranging from corporate jets to small, propeller-driven Cessnas, have booked parking places for Formula 1 race weekend. There are still a few spots left. Other area airports expect to be busy, including Pflugerville's Austin Executive Airport, and airfields in Georgetown, San Marcos, and Horseshoe Bay. For those flying commercially, Halbrook says there will be a warm Austin welcome at the baggage claim area. More than 70 volunteer hosts will be on hand to help guide visitors – many of whom will be visiting Austin for the first time – to their ground transportation and destination choices. courtesy SH 130 Concession Co. It's been almost three weeks since the new stretch of State Highway 130 opened on Oct. 24. Now the temporary freeway is officially a tollway. And that's how it's going to stay, for the next 50 years or so. The new segments of SH-130, which run just south of the Austin-Bergstrom International Airport to Seguin, were free to motorists until Nov. 11. Now the the toll rate has been set at $0.15 per mile for passenger vehicles with TxTag service. Vehicles without a TxTag can also use the tollway, and will be billed through a pay-by-mail service. "With this new road, motorists can travel 90 miles of toll road and bypass I-35 congestion between Seguin and Georgetown for about $12," the Texas Department of Transportation says in a press release. The Austin City Council hopes to make downtown Austin easier to get around. The city's Planning and Development Review Department presented progress on the Downtown Austin Wayfinding System this morning. 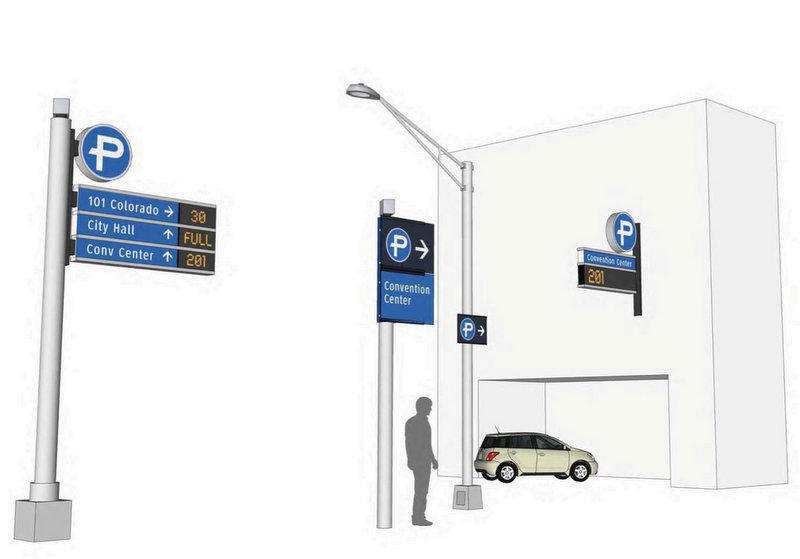 Under this plan, inconsistent and vague signs downtown would become more uniform and detailed. Gateways into downtown (like the passage under I-35 on Seventh Street) would also get a facelift. In addition to increased signage, the design firm the city has contracted with – Pennsylvania-based MERJE – has created signs that are in step with international logos for parking, transportation, information and more, with an Austin flair. The National Weather Service has issued a Dense Fog Advisory for much of Central Texas this morning. The advisory is in effect until 10 a.m. 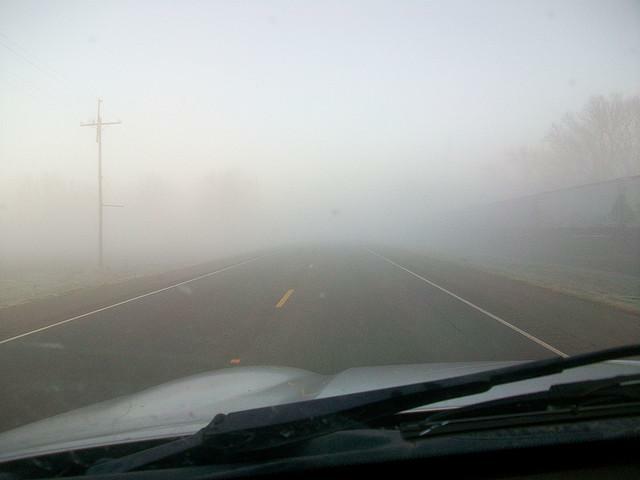 Forecasters say areas of dense fog are expected through the morning—especially along and southeast of I-35. Visibility could drop below one quarter of a mile. A slew of events this weekend will make navigating downtown Austin a bit more challenging than usual. The seventh annual Fun Fun Fun Fest is already underway at Auditorium Shores. Bouldin Avenue and South Fifth Street/Dawson Road are open to residents only. No festival parking is allowed in Bouldin Creek neighborhood. Many more street closures are in effect Sunday, when the Susan G. Komen Race for the Cure 5K launches. East 18th Street from Congress Avenue to San Jacinto Boulevard and Brazos Street from MLK Jr. Boulevard to East 17th Street are first to close, at 6 a.m. on Saturday, Nov. 3. Update (Nov. 2, 7:30 a.m.): Austin City Council members voted 5 to 2 Thursday to grant a total of 30 new taxi permits to two of the city’s cab companies. 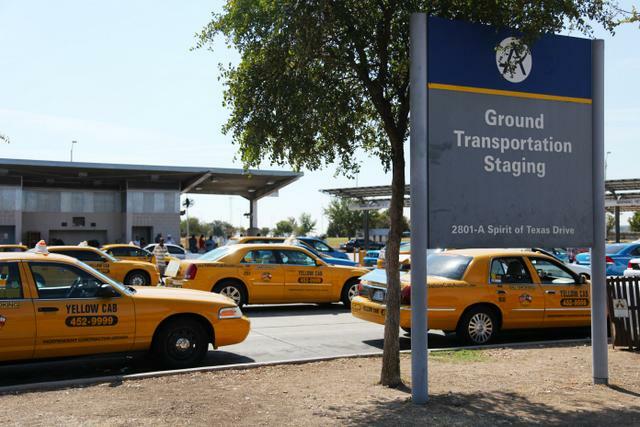 Members of the Taxis Drivers Association of Austin had argued that there are too many cabs on the road and that they’ve seen a decline in income. But the two cab companies say the new permits are necessary to help level the playing field between them and their larger competitor. 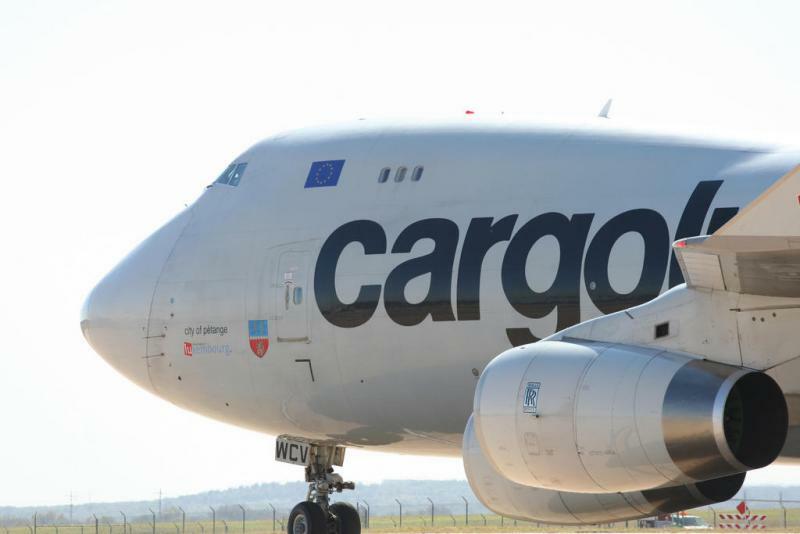 "[We are in favor of the vote] In order to improve our company's service to not only our passengers, but to our drivers. We've been waiting since December of last year to find out if were receiving 10 additional permits," Bertha Means of Austin Cab said. 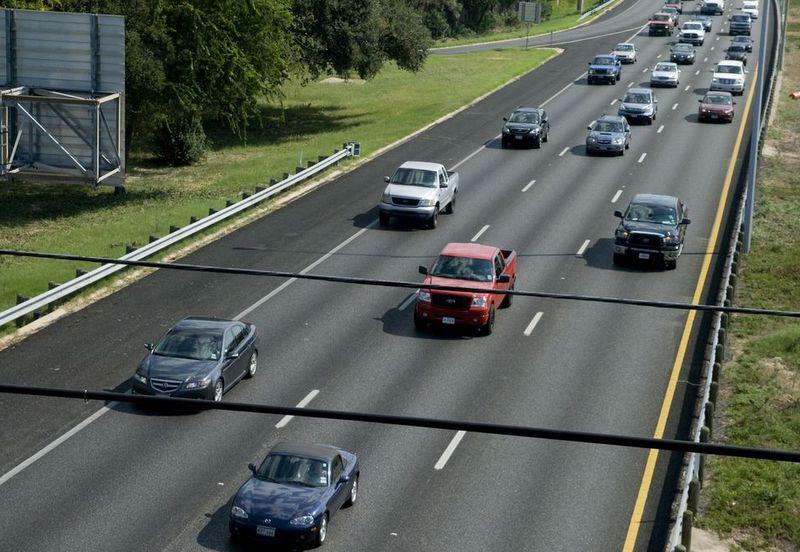 Will 'Left Lane for Passing Only' Signs Make a Difference? Here’s a mantra you may repeat to yourself in Austin traffic (likely in-between bouts of profanity): The left lane is for passing only. Despite the fact that passing on the left is the safest practice (and the fact that Texas has prohibitions against passing on the right), it’s a practice that’s routinely disregarded – just ask any Central Texas motorist. Before you get your hopes up, here’s the rub – they’re only going up on highways with speed limits over 75 mph. 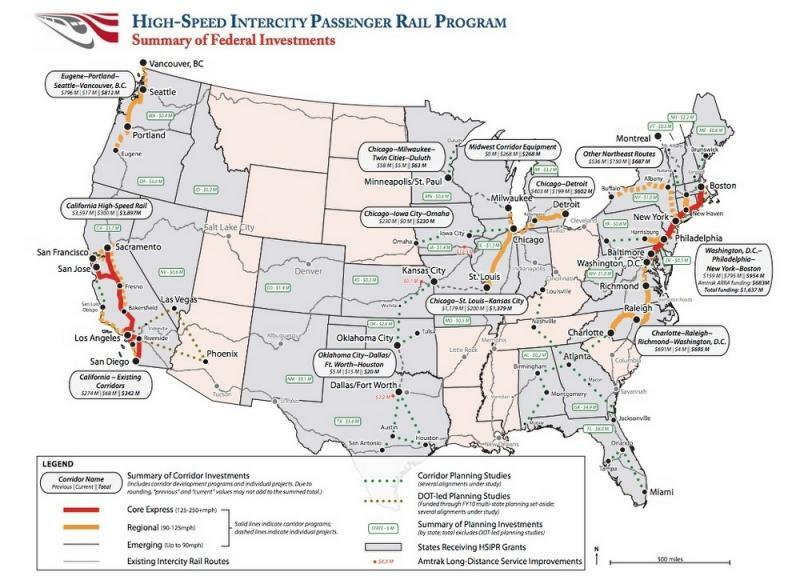 That excludes Mopac and Interstate 35 as they cut through most of Central Austin. The fastest road in the country is now open to drivers in Central Texas. The 85 mile per hour portion of State Highway 130 opened this morning. 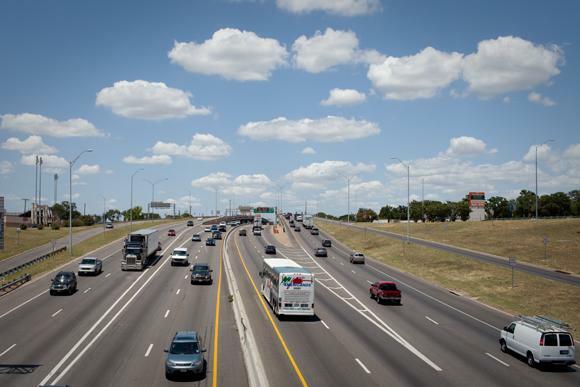 The toll road stretches across about 41 miles from Mustang Ridge to Seguin. It will soon cost drivers 15 cents per mile—or $6.17 to drive the length of the road—but it’s free through Nov. 10th. Eighteen-wheelers will be charged 60 cents per mile. But, as reported last month, truckers may avoid the toll road altogether because driving over 65 mph reduces fuel efficiency and also raises safety concerns. Capital Metro is prepping for the traffic nightmare that’s likely to be Formula 1 weekend in Austin. The transit company will be offering a free shuttle loop around downtown to help visitors and Austinites navigate road closures. Cap Metro will also increase trips to and from Austin-Bergstrom International Airport, for race fans coming into town and locals heading out to avoid the mayhem. And, for the first time ever, MetroRail will operate on a Sunday. 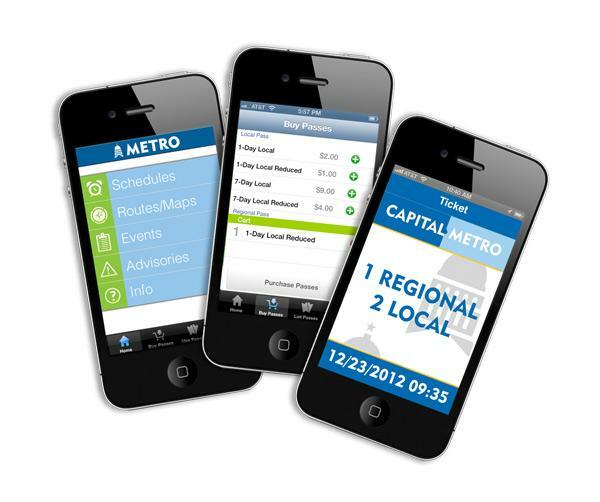 But what may be most interesting to those who rely regularly on Capital Metro service is that the company is debuting a mobile ticketing app for use during F1. M² (pronounced M-squared) stands for More Mobile App. Starting Oct. 31, the free app will be available in the Apple Store and in Google Play. While the specifics of how the app will work aren’t yet clear – Cap Metro’s description only says “Operators may request you to tap the screen to confirm pass authenticity” – riders will be able to purchase and use one-day or seven-day passes on their phones. Highway 183 in Cedar Park Closed at 9 a.m.
A stretch of US 183 in Cedar Park will be closed this morning. Starting at 9 a.m., 183 will shut down between the Leander city limit and RM 620. The freeway will stay closed until sometime around noon. The closure is needed to make room for two trucks carrying oversize loads. Power lines and stoplights need to be lifted along the route to allow the trucks to pass underneath. Intersections and sections of the highway will be open before and after the trucks pass through each intersection, but traffic will be unable to pass the trucks in either direction. 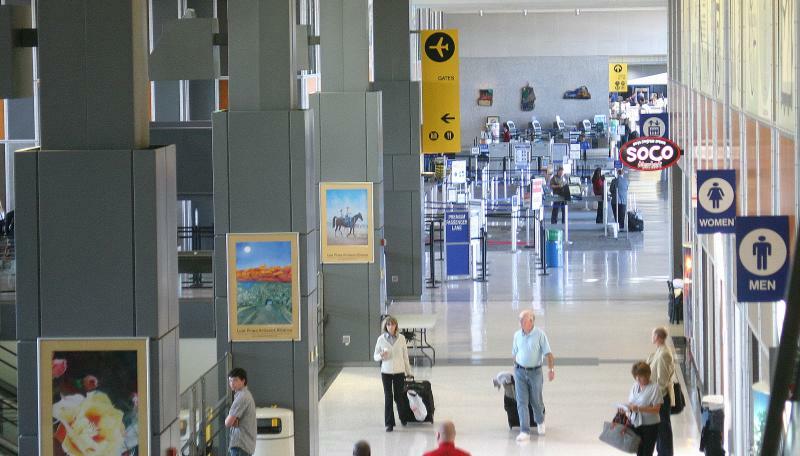 Mondays are typically one of the busiest days at Austin-Bergstrom International Airport. And officials say today will be especially busy—as folks who were in town for the Austin City Limits Music Festival head out. ABIA officials are expecting longer-than-normal security waits—as much as an hour long. To have time to check in and go through security, the airport is asking everyone to arrive at least two hours ahead of their scheduled flight. 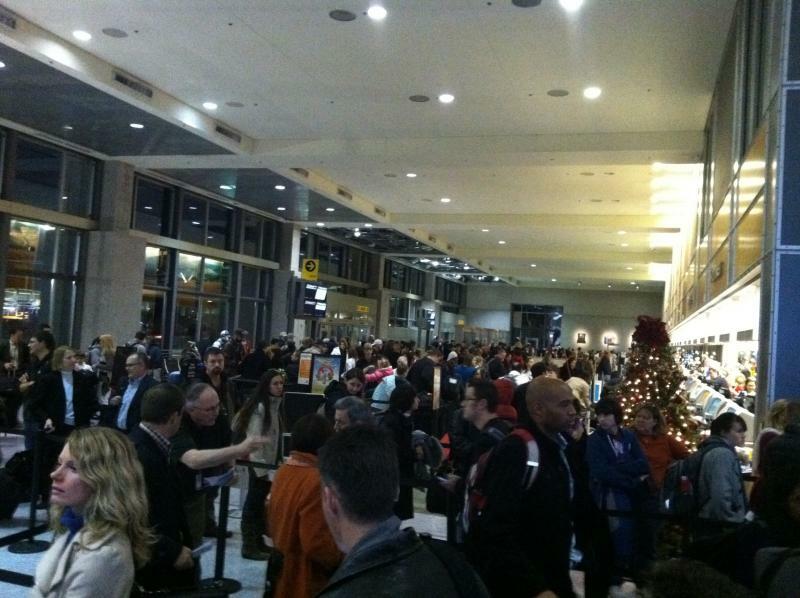 "Airport is insanely busy today .. Like 400 people waiting in security ..," tweeted @austin_dsouza. 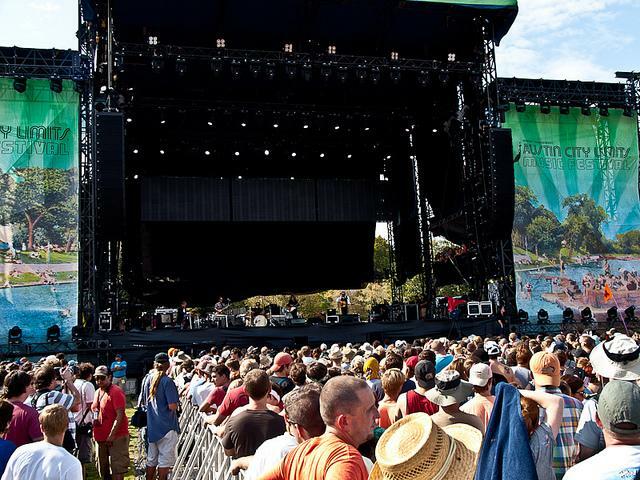 With 70,000 people making their way there each day, you can expect heavy traffic this weekend as people head down to the Austin City Limits Music Festival. Road Closures: The city is closing or reducing lanes around the park including Barton Springs Road from around MoPac to Robert E. Lee Road. Catch the Bus: Roads will also be closed around Republic Square Park at Fifth Street and Guadalupe Street to make room for Capital Metro's free ACL Shuttle at downtown. The shuttle drops off at ACL’s doorstep in Zilker Park. With woolly traffic expected this weekend, city officials are reminding Austin drivers that texting while driving is banned under city law. Texting while driving is a class C misdemeanor, which means offenders could face up to a $500 fine. And smart phone users should know that all "electronic messaging" is banned. That means no email, no Facebook, no ACL Festival iPhone app, and especially no Words With Friends behind the wheel. Police Chief Art Acevedo asked drivers to be especially aware of pedestrians around Zilker Park this weekend, which, of course, is hosting the Austin City Limits Music Festival this weekend. Acevedo says crashes are likely to happen when texters look up from their phones and overcorrect. 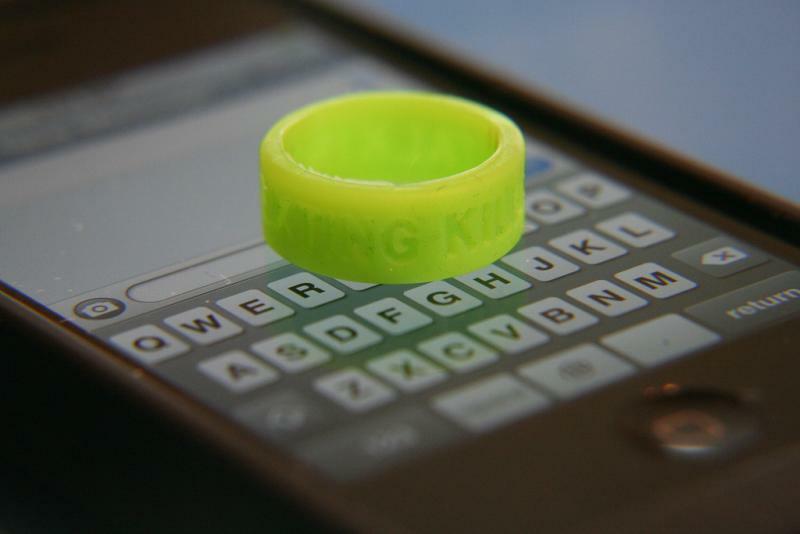 To remind drivers not to text, Acevedo sported an orange thumb band, and encouraged others to do the same.